To ask other readers questions about Sum, please sign up. I believe the ISBN 0307389936 is associated with the wrong cover. That's the ISBN for the edition I have, and my edition has the same cover as the one marked Kindle edition here. Anyone else experience this? In the afterlife you discover that all the goodreaders are in the same walled-off section of heaven. God greets you in the form of your ideal librarian. In the goodreads heaven library you witness the librarian gamut: examples include a fatherly professor, a stern but gentle middle-aged woman, and a supermodel in a plaid skirt with legs that won’t quit. If you are a seventeen year old girl God is a combination of Ben Harrison and that guy from 500 Days of Summer. The more time you spent on goodre In the afterlife you discover that all the goodreaders are in the same walled-off section of heaven. God greets you in the form of your ideal librarian. In the goodreads heaven library you witness the librarian gamut: examples include a fatherly professor, a stern but gentle middle-aged woman, and a supermodel in a plaid skirt with legs that won’t quit. If you are a seventeen year old girl God is a combination of Ben Harrison and that guy from 500 Days of Summer. The more time you spent on goodreads the more status you have in heaven. When you first arrive God checks the library computer (there are never lines, as everyone’s different version of God has his/her own computer) and gives you a badge that displays your total hours logged onto goodreads. If you have logged many hours God shakes your hand, high-fives you, or blows you kisses. The people with the most time on their badges (these badges are gold) get the best tables at the goodreads heaven coffee shop and pick what the book clubs read. Ginny Jones is the coffee shop waitress but is never allowed to read any books. If you were involved in any goodreads fights, or ever deleted your profile, God wags his/her finger at you and makes you apologize to all involved parties. If the fight was especially egregious God makes you hug. In goodreads heaven you always look like your favorite avatar picture. In goodreads heaven you can always find your favorite place to read, whether it’s on the subway, your childhood bedroom, or the library’s corner chair. In goodreads heaven your favorite characters come to life. Many of the women goodreaders are walking around with men who look suspiciously like Jamie from Outlander. The heaven goodreaders voted and decided that books should continue to have tangible form. They liked the smell of old pages, the feel of a trade paperback, and the sense of anticipation accompanying the moment when the librarian hands over your reserve order. Some dissenters lobbied that readers should only have to touch a cover to absorb a book’s contents, but just about everyone else said that was cheating. The dissenters were especially upset because they felt like everyone else had read Coetzee and Murakami and they wanted to catch up, but the majority ruled against them. In goodreads heaven friend whores are in trouble. They are required to take every friend to dinner and listen to them talk for at least an hour. This was a reasonable punishment for those who wanted to pad their friends list, but God soon realized that this allowed creepy guys who only friended women the opportunity to talk with these women face to face. In turn these girl collectors can only talk with each other. They share tales of the best pics and attempt to interact with cute goodreaders but discover that, as if they were ghosts, no one but other girl collectors can see them. 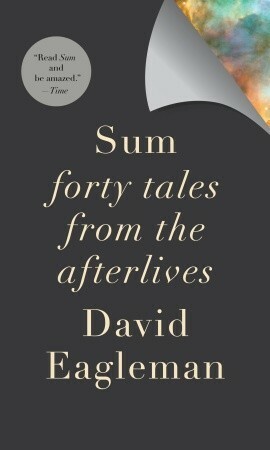 In Goodreads heaven you meet David Eagleman, the author of Sum. You tell him you liked his book, for the most part, but wonder if he realizes that he stole “Graveyard of the Gods” from Neil Gaiman (Mr. Gaiman doesn’t have time to worry about this because goodreaders are chasing him all over heaven) and that some of the forty themes (e.g. heaven is so boring it’s hell, people get sick of immortality and volunteer for suicide) have been done before. You tell him some of his vignettes (“Mirrors”) are moving, while others (“Death Switch”) are funny and still more (“Blueprint”) thoughtful. You thank him for expanding consideration of the afterlife beyond our limited western hemisphere mindset. You admit that Sum didn’t rock your world but add that a few of your goodreads friends loved his book. He seems distracted and questions when he’ll meet these people. You also ask where you can find his publisher, since this book (which you got from the library, of course) lists for twenty bucks but takes less time to read than People magazine’s “best dressed” issue (not that, uh, you ever wasted a minute on magazines back on earth, of course not). Eagleman shrugs and walks off. Then you see your librarian with the next book on your reserve list. You blink to your perfect reading spot. You sip from a cup of coffee, all the time in the world, and open to the first page. You do not have to be a subscriber to any of the more common religions in this world to harbor some notion, some hope, that there might be a form of personal existence beyond death. Eagelman has come up with forty possible post-mortem futures and offers them up in bite-size stories in this slim volume. The tales range from tedious to inspired. There is an O-Henry-esque tale in which a man’s greatest desire is to become a horse. A vision of God as being fascinated with Mary Shelley’s masterpiece You do not have to be a subscriber to any of the more common religions in this world to harbor some notion, some hope, that there might be a form of personal existence beyond death. Eagelman has come up with forty possible post-mortem futures and offers them up in bite-size stories in this slim volume. The tales range from tedious to inspired. There is an O-Henry-esque tale in which a man’s greatest desire is to become a horse. A vision of God as being fascinated with Mary Shelley’s masterpiece was inspired. Some portray people as cogs in a much larger reality; some are morality stories in which we come face to face with the true nature of who we were during our actual lives. People can be cancer cells in the body of God or walking recorders in a vast experiment, sometimes we are the experiment. As with science fiction, a consideration of the post-mortal applies its selected mask to foibles, values and triumphs of humans. The images that are created are views of ourselves as we are, and not so much as we might be. There is a great deal of clever in this collection, interesting ideas, too many devoid of personal or emotional content. Occasionally I found myself reviving my inner teen, rolling my eyes and muttering “whatever,” but a few pages on would come across a story that was wonderful. If you can tolerate the ups and downs and are willing to work through a lot of lesser notions to get to the jewels, Sum is well worth reading. It will not take up much of what little time you have left. BTW - My book goddess will be featured Friday, 7/8/16 on Book Studio 16, a Harper live program on Facebook that shows publishing behind the scenes. It will be on at 10:30a. Click here. I recently re-read this and still love it. I’ll leave my original review below and add some excerpts now. I’ve read or browsed through this several times, and I never remember all the possibilities, but I definitely remember the sense of “be careful what you wish for” that permeates all of the stories. You think a simple, unhurried life sounds good, one with no major decisions to make. You give it some thought and figure you might try life as a horse this time. You make your choice, and as your mind begins to slowly change, easing you into your new, peaceful form . . .
What alien life form did we descend from then? Ah, it’s wonderful, and no two chapters are the same. I’ll be ready to enjoy them again one day, I’m sure. p.s. I listened to many of the stories on the audio version and they were terrific. 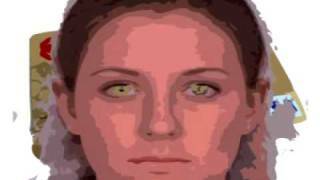 Different narrators - both male and female voices with different native accents. Great way to differentiate the stories. 2011 brief review [and I DID buy a copy]. My favourite video game of all time is a homemade 2D platformer on the little-known Yaroze—a black, programmable Playstation—called Time Slip . In this game you are a snail with a one-minute lifespan who has to use his time on screen to stand on buttons that open doors to other parts of the level. Once the minute is up, the snail is reincarnated as another snail at the beginning of the level, or at the latest checkpoint. The ghost of your previous snail remains on the map, reliving its movement My favourite video game of all time is a homemade 2D platformer on the little-known Yaroze—a black, programmable Playstation—called Time Slip . In this game you are a snail with a one-minute lifespan who has to use his time on screen to stand on buttons that open doors to other parts of the level. Once the minute is up, the snail is reincarnated as another snail at the beginning of the level, or at the latest checkpoint. The ghost of your previous snail remains on the map, reliving its movements after its time is up, with more and more fresh snails coming until the map gets clogged up with past selves. If you come into contact with any of your previous snail-selves, it’s game over. This raises quite a profound metaphysical conundrum for a cheapo game coded by two nerds. Imagine if we had the chance to live our lives over, in the same circumstances, with knowledge of our previous selves altering how we moved through the world, but relying on certain foundations having been laid in these previous lives for advancement in our then-present lives. Like concentric Russian dolls whose contact would spell extinction. Knowing we had freedom to live multiple, or endless lifetimes, with the only caveat no touching our previous selves, how would this effect how we try to solve the frustrations and problems in our present lives, knowing contact with people in our previous lives would be limited to the few moments our past selves weren’t in contact with these people? For example, can you imagine how tiring it must be for someone married to seven reincarnations of the same person, having to tend to all their needs like a revolving-door of husbands/wives? How could we stay away from people, knowing our presence there would increase the chance of our own death? How could we order our lives so that our legacies built up over two hundred or so years? What if we peaked in our first lives, and the subsequent reincarnations are simply failures and frustrations? “Ve…Sonraki Hayattan Kırk Öykü” beni çocukluğuma götüren bir kitap oldu. Hayal gücümün henüz çok örselenmediği hayatımın ilk yıllarında sürekli evrene, varoluşa ve Tanrı’ya dair gülünç ama kendimce mantıklı fikirlerin hayalini kurardım. Bu kitapta da aynı öyle tasavvurlar var. Eğlenceli ve zihni geliştiren bir okuma vaat ettiğini söyleyebilirim. Ancak ben öyküleri arka arkaya okuma hatasına düştüm. Öyle olunca sürekli kendini tekrar eden ve birbirinin üzerine binen parçacıkları okumuş oldum ve n “Ve…Sonraki Hayattan Kırk Öykü” beni çocukluğuma götüren bir kitap oldu. Hayal gücümün henüz çok örselenmediği hayatımın ilk yıllarında sürekli evrene, varoluşa ve Tanrı’ya dair gülünç ama kendimce mantıklı fikirlerin hayalini kurardım. Bu kitapta da aynı öyle tasavvurlar var. Eğlenceli ve zihni geliştiren bir okuma vaat ettiğini söyleyebilirim. Ancak ben öyküleri arka arkaya okuma hatasına düştüm. Öyle olunca sürekli kendini tekrar eden ve birbirinin üzerine binen parçacıkları okumuş oldum ve nihayetinde de sıkıldım. Diğer yandan öyküler o kadar kısa ki bu benim alışık olduğum bir kurmaca süresi değil. İki sayfa da anlatılan şey iki dakikada akıldan uçar gibi bir hissin içine düştüm. Şuan bir iki tane öyküyü hatırlıyorum. Yine de keyifli ve farklı bir okuma olduğunu söyleyebilirim. Yine de siz okurken bir iki tane okuyup, ara verip, ilerleyin bence. Some of these stories were indeed imaginative scenarios of what the afterlife is like or what God might be like. But because his Heaven or God is always imagined as some inversion of a human hierarchy or scale...it gets repetitive very fast. God always lacks some human quality that intrinsically keeps him as God and us as humans, or...he's just like us, but just a smaller or larger scale. Because his Heaven is always some rearranged variation of the human life, all the stories start to sound the Some of these stories were indeed imaginative scenarios of what the afterlife is like or what God might be like. But because his Heaven or God is always imagined as some inversion of a human hierarchy or scale...it gets repetitive very fast. God always lacks some human quality that intrinsically keeps him as God and us as humans, or...he's just like us, but just a smaller or larger scale. Because his Heaven is always some rearranged variation of the human life, all the stories start to sound the same. Because these stories are so hypothetical and abstract, they become very repetitive and you feel as if he's flogged his one trick pony to death by the end of the book. I also disliked the author's photo...not his looks, just the photo. This is a suite of variations on the possibilities of different kinds of afterlives. Each of the forty tales is usually only about a couple of pages long, but each one is densely packed with mind-bending what-ifs. He imagines wildly different ways that an afterlife, if it existed, could be structured. Some are exquisitely sad, such as this first paragraph from 'Metamorphosis': "There are three deaths. The first is when the body ceases to function. The second is when the body is consigned to the This is a suite of variations on the possibilities of different kinds of afterlives. Each of the forty tales is usually only about a couple of pages long, but each one is densely packed with mind-bending what-ifs. He imagines wildly different ways that an afterlife, if it existed, could be structured. Some are exquisitely sad, such as this first paragraph from 'Metamorphosis': "There are three deaths. The first is when the body ceases to function. The second is when the body is consigned to the grave. The third is that moment, sometime in the future, when your name is spoken for the last time." Others offer the possibility of a sublime eternity, in which the self is split into an infinite set of selves, as in a prism, which exist simultaneously, and interact, as multiple versions of the self at different ages, meeting together periodically at reunions. A collection of forty short texts describing different possible afterlives that gives you a few gems here and there, but also leaves a lot to be desired. The characters are completely anonymous - which is fine. This is simply a collection of thought experiments. In one story we are atoms in Gods body, in another the dead are not allowed to rest until everyone alive have forgotten about them (Shakespeare must be pretty mad by now if this one turns out to be true). There are a lot of stories circli A collection of forty short texts describing different possible afterlives that gives you a few gems here and there, but also leaves a lot to be desired. The characters are completely anonymous - which is fine. This is simply a collection of thought experiments. In one story we are atoms in Gods body, in another the dead are not allowed to rest until everyone alive have forgotten about them (Shakespeare must be pretty mad by now if this one turns out to be true). There are a lot of stories circling around the theme of a creator or deity not being perfect. Not being in absolute control, not being able to fix everything or make everybody happy. Or even being able to understand their own creations. God considers Himself to be a medical doctor, a biologist without parallel, and He has a deep, painful relationship with any story about bringing animation to the unanimated. Very few of His creatures had thought deeply about the challenges of creation, and it relieved Him a little of the loneliness of his position when Mary wrote her book. The stories try their best to twist and turn our ideas and expectations about life, afterlife and being human. Or being God. Usually there is a twist at the end that shows the downside or the unexpected results of some specific organization of life or afterlife. In the beginning the inventiveness was great, but around the midway point I found my enthusiasm for this collection quickly plummeting. The further I read, the more I got the feeling that the book tried too hard to be clever and deep, and no longer succeeding, like in the first stories. It was also starting to become a bit too repetitive - to many variations on the same themes. I got the impression - like with so many short story collections, it seems - that the best stories were placed in the front of the book, to get you hooked, and then all the mediocre ones were doled out towards the middle and end. But let me add that the further I read, the less I dwelled on each story. The book might have benefited from me only reading one story a day. Such a quaint little read! I didn't know what to expect when going into this book but I was pleasantly surprised. Eagleman takes the reader to mystical and dark places as he contemplates what the afterlife may hold. From a heaven where Mary Shelley (author of Frankenstein) is Queen to an afterlife where you act as the extras in living peoples dreams - this book is a real look into an incredible imagination. Although each tale is only a couple of pages long I was fully transported to each ghostly Such a quaint little read! I didn't know what to expect when going into this book but I was pleasantly surprised. Eagleman takes the reader to mystical and dark places as he contemplates what the afterlife may hold. From a heaven where Mary Shelley (author of Frankenstein) is Queen to an afterlife where you act as the extras in living peoples dreams - this book is a real look into an incredible imagination. Although each tale is only a couple of pages long I was fully transported to each ghostly world. It was truly magical! I loved this book. Normally I find it difficult to read an entire volume of short fiction (the stories in this book are so short they could almost be called sudden fiction), but this collection of hypothetical versions of the afterlife was so cleverly done that I couldn't stop reading it. Brilliant! Even though I've already read it I want to buy a copy to add to my personal library. Pure delight to those who love speculations and out-of-the-world stories. Pun intended. Want to stretch your mind for a bit? Check out this little book packed with imaginative possibilities of what happens after you die. Written by a neuroscientist, Sum captures many facets of the Afterlife that are told succinctly in a series of vignettes that pull from science, fantasy, sci-fi, mythology, pop culture, religion, and probably a few nightmares and daydreams. But what if....? A beautiful elegy for the lives we have chosen to lead or not to lead. Sum is a wonderous piece of writing. While the book is comprised of 40 imaginings of the afterlife, it is much more a celebration of everything which has come before it. After reading Sum, I was left awestruck again by the world around us. I read Thai version last night. A good translation and very thought-provoking. Recommended! Now putting the finishing touches to the Bulgarian translation. Caveat: Sum will bring no insight to those who seek visions of the afterworld--and no consolation either. ;) Instead, it may make us re-examine our very own lives, here and now. Perhaps avoid some of the blunders. Definitely laugh. At ourselves, most of the time. In the afterlife you can enjoy all possibilities at once, living multiple lives in parallel. You find yourself simultaneously eating and not eating. You are bowling and not bowling at the same time. You are horseback riding and nowhere near a horse. And then you are here. You are simultaneously engaged in her conversation and thinking about something else; she both gives herself to you and does not give herself to you; you find her objectionable and you deeply love her; she worships you and wonders what she might have missed with someone else. To understand the meaning of this afterlife, you must remember that everyone is multifaceted. And since you always lived inside your own head, you were much better at seeing the truth about others than you ever were at seeing yourself. So you navigated your life with the help of others who held up mirrors for you. People praised your good qualities and criticized your bad habits, and these perspectives--often surprising to you--helped you to guide your life. So poorly did you know yourself that you were always surprised at how you looked in photographs or how you sounded on voice mail. Fitfully imaginative, often repetitive meditations on what might happen after we die that frequently get sidetracked into cute commentaries on how we live now. Which isn't unexpected, I suppose. But the most entertaining and thoughtful of these stories truly fulfill the promise of the premise; the others just didn't do much for me. Also, way too many of them involve variations on the idea that we are unknowingly cogs in some vast system, but this might not bug if I hadn't read the book in two si Fitfully imaginative, often repetitive meditations on what might happen after we die that frequently get sidetracked into cute commentaries on how we live now. Which isn't unexpected, I suppose. But the most entertaining and thoughtful of these stories truly fulfill the promise of the premise; the others just didn't do much for me. Also, way too many of them involve variations on the idea that we are unknowingly cogs in some vast system, but this might not bug if I hadn't read the book in two sittings. Interesting that on a reread and many years after first reading this, I have lowered my rating! It’s a quick read and thought provoking but I found the stories a little hit and miss. They were snippets of ideas. I wonder if my reading taste has changed- I used to be much more engaged with ideas of life after death, so it’s weird that as I get older and presumably closer to finding out the truth for myself, I’m less interested! If I could give this book 6 stars I would! I thought it was brilliant and I plan to read it again and often. Sum is a collection of short stories that are visions of the way we could conceive of life after we die. It is a clever way to think about your life from afar. It alternates between esoteric, profound, and hilarious. A charming little thought-experiment conducted by a writer of rich yet limited imagination. This book has received rave reviews in a number of journals over the past few months, and I was on a waiting list at the library for weeks before I had a chance to check it out myself. Clearly influenced by the structured, dreamlike musings of Italo Calvino's Invisible Cities, Sum: Fory Tales from the Afterlives dances neatly through a series of post-life possibilities. Some are clever, some are odd A charming little thought-experiment conducted by a writer of rich yet limited imagination. This book has received rave reviews in a number of journals over the past few months, and I was on a waiting list at the library for weeks before I had a chance to check it out myself. Clearly influenced by the structured, dreamlike musings of Italo Calvino's Invisible Cities, Sum: Fory Tales from the Afterlives dances neatly through a series of post-life possibilities. Some are clever, some are odd, but few manage to be more than a change of curtains on what is clearly a window into a Judeo-Christian background. There is always a God (capital G), always a mention of sinners and a "you guys get to go one place, and you all go over here." Unfortunately, this book is a missed opportunity for something a bit more mystical, creative, or even simply adventurous. probably 3.5 actually. A fascinating book of short tales about possible afterlives, including one where all possible versions of you exist (quantum physics I think), another where God is so small he works on a microbal (?) level, and is simply unaware of us, a bi-product of bacteria. Or where the afterlife conforms to capitalist principles and for a reasoable price you can download your version of heaven. Or When you arrive in the afterlife, you find that Mary Wollstonecraft Shelley sits on a th probably 3.5 actually. A fascinating book of short tales about possible afterlives, including one where all possible versions of you exist (quantum physics I think), another where God is so small he works on a microbal (?) level, and is simply unaware of us, a bi-product of bacteria. Or where the afterlife conforms to capitalist principles and for a reasoable price you can download your version of heaven. Or When you arrive in the afterlife, you find that Mary Wollstonecraft Shelley sits on a throne. This is because God's favourite book is Frankenstein - at last someone understands Him, what it is like to be a creator, albeit a crude one. Öldükten sonra nereye gideriz ya da bir yere gider miyiz? Tanrı dediğimiz şey aslında bir devanası mı? Ya birileri bizi hep anarsa ve o zaman biz de sonsuza dek var olursak ne olur, sıkılmaz mıyız? Ya Tanrı bizden çok bunalmış ve çoktan başka evrenlere taşınmışsa? Bu hikayeler bir harika dostum! Yow. That’s just true in a sad way: the only afterlife everyone can be sure of is when people speak of them once they’re gone. There’s definitely poignancy in the idea of waiting for that last time your name is spoken before you move on. I found some of the stories a little too similar in tone or basic idea, but it’s still a creative collection. Kitap yaratıcı bir zihinden çıktığı belli olan ve üzerine düşünmesi zevkli olabilecek ölümden sonra yaşam hayalleri sunuyor ama ben kitabın kurgusunda olmamış bir şeyler sezdiğim için çok keyfini çıkaramadım bu hayallerin. Yazarın bilim insanı olan tarafı, yaratıcı yazar olan tarafını biraz bastırmış sanırım. Bu türde - türden kastım yazarı bilim kökenli olup, kurguya dayalı ama yazarın bilim uğraşına dayalı bilgisini de az ya da çok içeren kitaplar - Alan Lightman'ın Bay Tanrı isimli kitabını ok Kitap yaratıcı bir zihinden çıktığı belli olan ve üzerine düşünmesi zevkli olabilecek ölümden sonra yaşam hayalleri sunuyor ama ben kitabın kurgusunda olmamış bir şeyler sezdiğim için çok keyfini çıkaramadım bu hayallerin. Yazarın bilim insanı olan tarafı, yaratıcı yazar olan tarafını biraz bastırmış sanırım. All 40 stories in this book are about afterlife. These are not your typical stories. They do not have a plot, characters, or even a clear clear beginning or an end. These are more like meditations on life. They contemplate on what afterlife may be like. The stories are highly creative, original and witty, and they rarely fail to amuse you(or make you smile). The theme of the book is "afterlife". This may mislead you that this book has a religious or holy side, or it is a spiritual book. However, All 40 stories in this book are about afterlife. These are not your typical stories. They do not have a plot, characters, or even a clear clear beginning or an end. These are more like meditations on life. They contemplate on what afterlife may be like. The stories are highly creative, original and witty, and they rarely fail to amuse you(or make you smile). The theme of the book is "afterlife". This may mislead you that this book has a religious or holy side, or it is a spiritual book. However, it is exactly the opposite. While the book seems to tell about the afterlife, it actually analyzes and reflects upon our "real and present" lives. Yet, it never crticizes or preaches. The writer is just a neutral observer pointing out how we live our lives. I personally liked this neutral, friendly and funny tone of the book. You are not overwhelmed by these insights and thoughts. It is written in plain, clear English; focusing on the ideas more than the language. While reading "Sum", I often remembered "The Invisible Cities" by Italo Calvino, which is one of my favorite books. Although "Sum" lacks the wonderful descriptions or the atmosphere of "The Invisible Cities", it is almost as inspiring and thought-provoking. To "sum up", "Sum" is a fun, amazing, and thought-provoking book which I highly recommend. I know I will take it off my bookshelf every once in a while, and read a few stories, as I like to do with good books that I never get bored of. David Eagleman is a neuroscientist, a New York Times bestselling author, and a Guggenheim Fellow. During the day he runs a neuroscience research laboratory at Baylor College of Medicine in the Texas Medical Center in Houston. At night he writes. His books have been translated into 23 languages.